Known by many names like, Fernleaf Maple, Maiku jaku or Dancing Peacock this plant is a real crowd pleaser no-matter what you call it. A small to medium size tree ‘Aconitifolium’ can be a little slow growing in the south and benefits from a little afternoon shade. 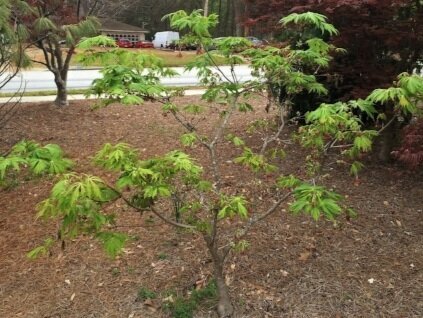 More upright when young ‘Aconitifolium' eventually forms an elegant round topped tree that is more broad than tall. Fall color is awesomely brilliant red, with yellow and orange all on its very large leaves. ‘Aconitifolium’ has been known by many names like, Fernleaf Maple, Maiku jaku or Dancing Peacock this plant is a real crowd pleaser no-matter what you call it. A small to medium size tree ‘Aconitifolium’ can be a little slow growing in the south and benefits from a little afternoon shade. More upright when young ‘Aconitifolium' eventually forms an elegant round topped tree that is more broad than tall. Fall color is awesomely brilliant red, with yellow and orange all on its very large leaves.